The next stop on our tour was the Korean War Memorial. This memorial is striking as it has multiple haunting statues and a marble walls with photographs from the war etched into it. Part of the memorial included the phrase “Freedom is not Free”, but the picture of it that I took did not turn out. 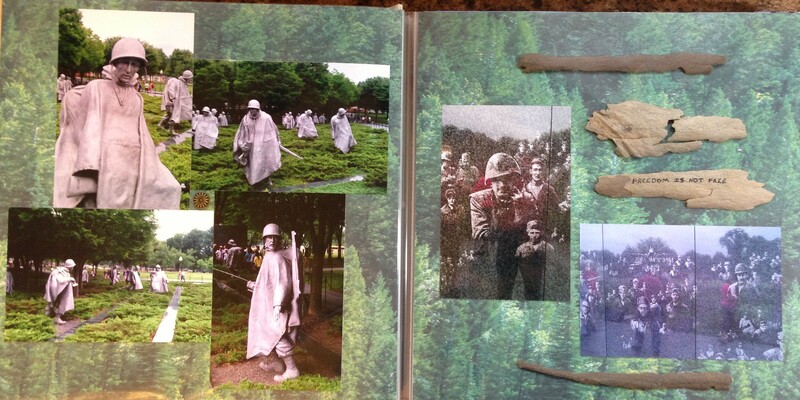 My son had picked up bark off of the ground near this memorial that he wanted me to put in the scrapbook. And to appease him I packed it, but wasn’t planning on using it. When I realized that my picture had not turned out I decided to use the bark and write the phrase on some pieces of it. I mounted the bark by using thick sticky tabs to pull them off of the page a bit. This was necessary so that they would not crack it we tried to glue them down flat. Also notice the pinwheel placement of the photographs on the left hand page. This is a new design that I used and I think that I will use it in some future pages as well. On this page I chose not to add too much special detail, cropping, or embellishments because I wanted the page to reflect the solemnity of the memorial. We just returned home last week from a trip to DC and we also went to the Korean war memorial it was great. I also went back at night and it looks very spooky with the lights on it.